New York, NY (January 15, 2013) – SPACE.com, the premier destination for innovation, technology, entertainment, astronomy and space news, is now accepting submissions for the SPACE.com Space Age Awards at Toy Fair 2013 in February. 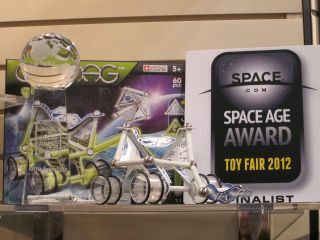 SPACE.com's team of editors and writers will be covering the most innovative new products at Toy Fair 2013 in New York City (Feb. 10-13) and selecting the recipients of its Space Age Awards. Winners will be selected from a variety of categories, including Best High-Tech Toy, Sci-Fi on Earth, Cosmic Space, Little Scientists, Retro Future and Do-it-Yourself Science. SPACE.com, a TechMediaNetwork company, launched in 1999 and is the world's No. 1 source for news of innovation, astronomy, skywatching, space exploration, commercial spaceflight and related technologies and entertainment. Our team of experienced reporters, editors and video producers explore the latest futuristic ideas, discoveries, missions, and trends -- interviewing expert sources and offering up deep and broad analysis of the findings and issues that are fundamental to or understanding of the universe and our place in it. SPACE.com articles are regularly featured on the web sites of our media partners: MSNBC.com, Yahoo!, the Christian Science Monitor and others. TechMediaNetwork is a leading technology media company that produces news and reviews reaching more than 25 million monthly visitors. TechMediaNetwork has reviewed more than 800 categories of products and services at TopTenREVIEWS.com, and publishes news, features and commentary at SPACE.com, LiveScience.com, Newsarama.com, TechNewsDaily.com, OurAmazingPlanet.com, BusinessNewsDaily.com, MyHealthNewsDaily, HermanStreet and LifesLittleMysteries.com. The company distributes content through its owned and operated websites, syndication partners and website partners. To learn more about TechMediaNetwork, visit www.TechMediaNetwork.com.